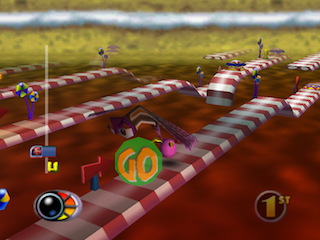 The game locks the player onto a 2.5 dimension track, with an abnormably large dragonfly taking the role of Mario Kart’s Lakitu, starting races and rescuing those who tumble below. This review is brought to you by Dante Mathis. If you want to review a game for Retro Garden, please write for us. When factoring in racing games on the Nintendo 64, ones mind immediately snaps to the primary games of Mario Kart 64 and Diddy Kong Racing, however an underrated, and third party racing game developed by Iguana Entertainment. Iguana is best known for their first person shooter series Turok, along with the home ports of various NBA Jam titles. Though aside from their sports and FPS ventures, in 1998 the company decided to give their mascot his own video game, albeit it would be in a Chibi style, anthropomorphic sphere. 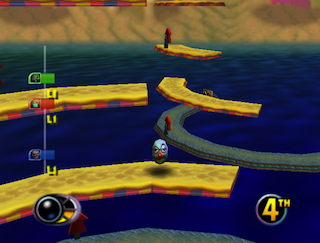 Nevertheless, this combat racer has lingering and very vague similarities to Super Monkey Ball, and various other combat racers, putting you on a 2.5-D, locked rail racer, moving on mostly vertically moving tracks via a grappling hook, which the player uses to either progress through the levels, avoid enemy projectiles, or even grapple with opponents, stunning them temporarily or throwing them from the track. The player can also collect various weapons to use throughout each level, which are referred to as ‘towers’ throughout the game, which has typically been a staple in the combat racing genre. In spite of the hindrance the game style presents, the developers still crafted 10 Worlds, divided into 10 towers each, and while some may seem similar, the game utilizes gaps, moving platforms, and spinning regions of track to create a time crunch, or even creating a multi-path feeling within stages. Various terrains are also employed, such as ice, green slime, and metal, which can’t be penetrated by the player’s grappling hook, and can be a hassle when approached from below. The player is also equipped with a glide ability to bridge certain gaps or terrains, and they have the option engaging a Turbo mode for a brief burst of speed. This, along with the included speed stripes in various towers, makes for a fast paced race almost every time, and it truly provides a decent challenge beyond the first world. The tracks are rarely ever linear, sometimes including multiple, circular tracks which players must jump between, or as ladders one must ascend. The game features an extensive host of characters to choose from, though admittedly there isn’t much difference, if any, in the character you pick. The game supports four player mode, which gives it the added benefit of being an underrated party game, which can turn quite competitive when four different people get behind the controller. As far as racing games go, which are my typical forte, Iggy’s Reckin’ Balls stands out as a unique spectacle, which I find myself enjoying time and time again. The game sports the common arcade mode as is standard for most combat racers, yet it also allows you to mix towers together and create your own championship, and also boasts a time trial mode and battle mode for added replay ability. It may not have created waves when it hit the market in America, however it serves as the first and only breakthrough into the gaming world for the mascot who greeted so many young gamers at the beginning of their favorite Turok games. While I was playing this game years before I had heard of Turok, it still looms as an under appreciated, and often overlooked combat racer in the Nintendo 64 library, and I would give it a chance any day.